Have you ever noticed how much cleaner your dog is after being to a groomer than when you wash him at home? You pour on heaps of shampoo, throw in a little water from the hose, give him a scrub and wash him off, but his coat still seems dull. One of the biggest problems with washing at home is shampoo residue being left on the coat and skin which can cause dullness and in some cases, serious skin conditions. Many, if not most dog shampoos suggest you pour the shampoo liberally over the dog. This is not only makes it hard to rinse out, but it wastes a lot of shampoo unnecessarily. Washing your dog can be quick and fun if you follow a few simple steps. If your dog gets vehicle oil in the coat, try brushing though liberal amounts of un-scented baby powder, oil and water just don’t mix. For removing chewing gum, use olive oil to rub into the gum and break it apart with your fingers. It should slide out in small pieces then shampoo with warm water as above. And that’s really all there is to it. 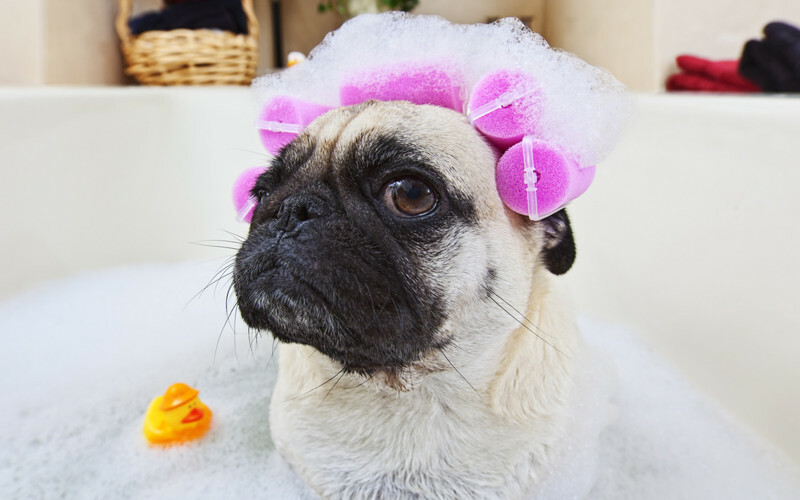 As always, brushing is more important than washing which helps remove dander, shedding coat and knots, and if in doubt, ask your groomer for advice for in-between maintenance.